his condition as soon as I hear anything. Please keep Jerry in your thought and prayers. Chuck Berry scheduled to perform at Cafe de Paris in London on Sunday the 20th October 2002. Chuck Berry show in Birmingham, England cancelled!! Birmingham, England on October 21th 2002 has been cancelled. 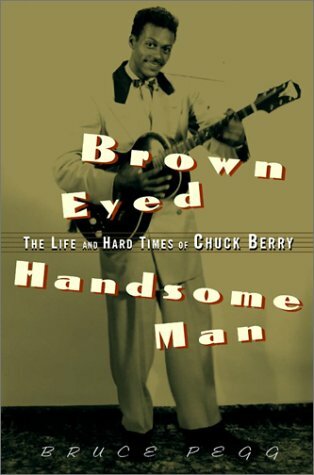 New book release: "Brown Eyed Handsome Man: The Life and Hard Times of Chuck Berry"
himself has rarely been forthcoming in either documentary or print interviews. black neighborhood in St. Louis, his first major hit song, "Maybellene,"
was an adaptation of a white country song, wedded to a black-influenced beat. the '50s, including "School Day," "Johnny B. Goode," and "Sweet Little Sixteen." his relations with an underage girl led to a conviction under the Mann Act. a story that will appeal to all fans of American popular music. Bruce Pegg teaches in the writing program at Syracuse University. conducting interviews and archival research. He lives in Canastota, NY.